No, this isn’t a post dedicated to Lord of the Rings (LOTR).. this is about a photo that I took after I was inspired by another photo but I think mine is better (is that a bad thing to say?).. 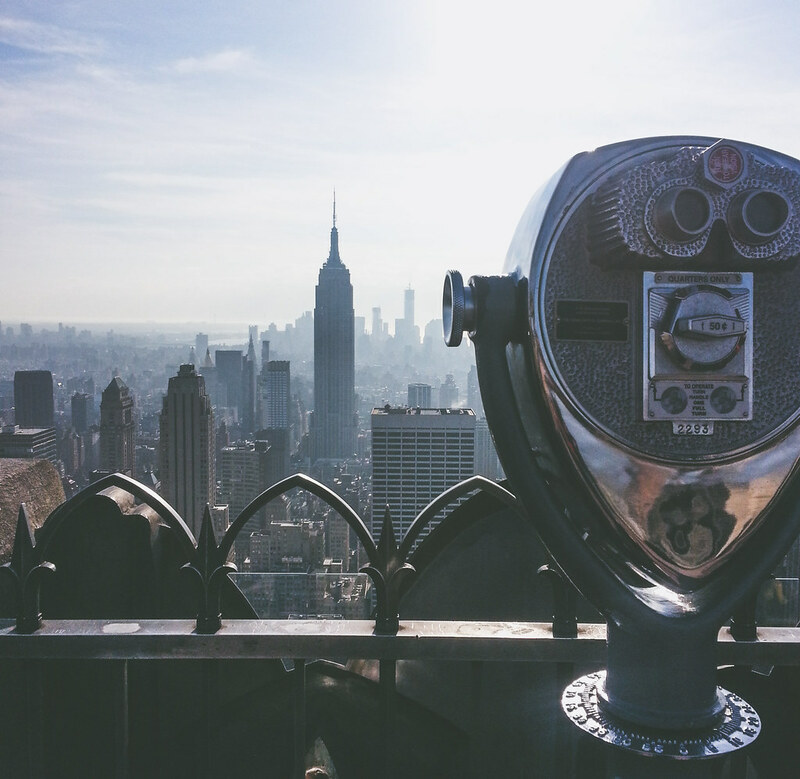 Why: Um, well the view for one and also … because Top of the Rock, New York City! Why Mine Is Better: Don’t get me wrong, the inspiration photo is still amazing and it did, after all, inspire me to go & get my own photo of the same view. However I just think that adding one of the viewers to the photo really enhances the photo a bit more. Fun Fact: I think I fell in love more with the viewers than the view.. I have like a dozen or so photos with them as the focal point 🙂 I also really love the Art Deco style of these viewers. Is ‘viewer’ even the right word for these things? How I Felt At The Time: I didn’t love NYC right off the bat. In fact, it wasn’t until I got back to Australia and was looking through my photos that I was kind of like “OMG I was in NYC! !” But I will say that standing at the top of the Top of the Rock was pretty darn amazing. I think being above the buildings instead of being dwarfed by them actually helped with how overwhelmed I felt by NYC. Well it helped for a brief moment in time anyway. What They Say: “They say” that the view from the TOTR is better because it has the Empire State Building in it. I can’t really comment on that. I had wanted to visit the Empire State Building for so long and even though I was staying like two blocks from the building and went past it pretty much everyday, I didn’t step foot inside. If anything, that is one of my big regrets from that visit. Mind you, there is probably a lot I would change from that trip but not going to the Empire State Building would definitely be number one. Don’t Get Me Wrong: It wasn’t a horrible trip by any means but if I did that trip now with the gift of hindsight, I would definitely go up the Empire State Building and I would also explore more of Staten Island. I would walk across the Brooklyn Bridge (or even just half way). I would wait for Jake Gyllenhaal at Stage Door after seeing him in a play. I would not fall over in front of half the NYPD & FDNY and I would appreciate the fact that I was actually in one of the greatest cities in the world. Final Thoughts: The views of the Manhattan skyline are one of the most recognisable in the world and having witnessed it for myself was pretty amazing actually. Nice picture. I’ve never been to NYC myself, but I agree, most people can recognize the skyline. I like that you included the viewfinder in it, I wouldn’t have considered that myself. I think as soon as I saw them I was hook haha. Couldn’t stop taking photos of them! Ooooooo. I might just have to do that! I will give you credit– don’t worry.